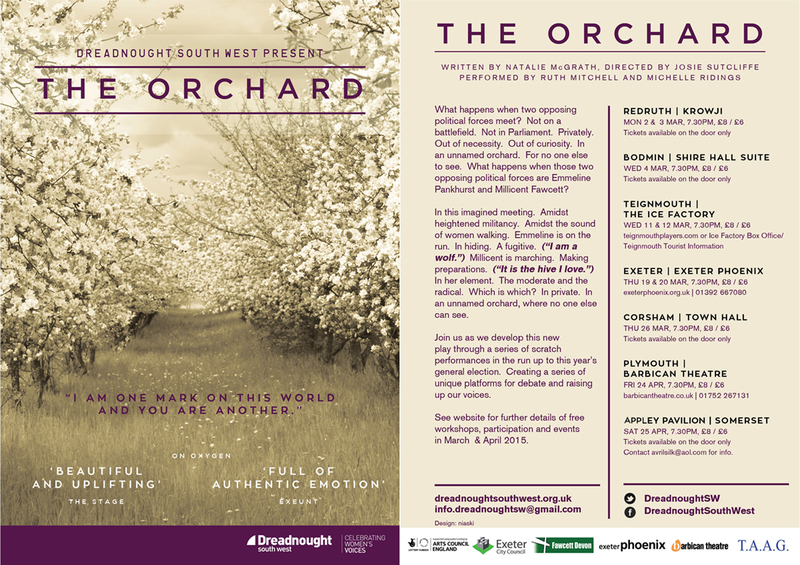 In 2015 we undertook a challenging way of developing our new play The Orchard. Instead of getting in the studio and keeping it to ourselves, we decided to see what would happen if we took the raw script out on the road instead, sharing it with audiences as scratch readings of this very early stage work, then listening to them as they responded to the script. In each place a new edit of the script emerged from writer Natalie McGrath in response to the dialogues undertaken with audiences. It was a completely new way for us to develop our work and relationships with audiences, and we want to thank everyone who came along and shared their thoughts. It was enormously enriching for us and humbling too that people were so eager and open in their responses. Great for us to listen in in this way. These thoughts have somewhere embedded themselves in the way the play has developed. Please have a look at Responses To Our Work to see some of the things said about The Orchard. Also have a look at and read about all the individual places we went to on the roadshow. This was all made possible with help from funding from Arts Council England SW, Fawcett Devon and Exeter City Council.